Recorded: Seattle Center Arena, Seattle, WA. USA 13th. March 1977. Comments: A 'new tape source' included full show, has recently seen daylight of this Seattle concert. Part has been released on vinyl disc in the seventies (Duck Soup 1LP)and eighties, (P.N.W.1LP & Mania 1LP), as well as a lot of cd's. But with this release we got the full show for first time. Japanese label Breakdown released a 2CDR with title 'A DAY AT THE...MASTER REEL' for a week or two before thisone. But, this Wardour release is on silver pressed disc, which that made it more collectable for collectors. On this evening in Seattle, both Queen and Thin Lizzy played seperat shows at this venue, as a part of the 'Queen Lizzy' tour. I guess Thin Lizzy did the first show as a support band. Both concerts are released on bootleg cd's. Roots: From a new tape source. 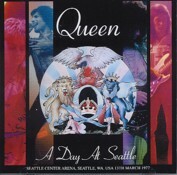 Queen’s final show on their US Day At The Races tour in Seattle is perhaps their most bootlegged tape. It is a great sounding recording of almost the entire concert. It surfaced on vinyl soon after the gig on the famous Duck Soup (Rodan Records SLA 0007) with about half of the show. P.N.W. Live is another well known vinyl title with this show which was copied under Pacific North Western and as Mania, with a pic from the Game era on the front cover. While all the compact disc releases were sourced from vinyl, the master cassette surfaced recently and is the source for A Day At Seattle on Wardour. Since tapes from this tour are scarce it is valuable just for existing, but the sound quality makes it very desirable. It is clear and enjoyable with considerable dynamics. The medley, a feature of all but one of Queen’s tours, begins with “Killer Queen” and includes “The Millionaire Waltz,” “You’re My Best Friend” and ends with “Bring Back That Leroy Brown.” This is perhaps the most uninspired of them all and doesn’t hold together well at all. When they will go on to play Europe they’ll add “Good Old Fashioned Lover Boy” to the medley (a song never played in the states). “Sweet Lady,” which followed the medley in many shows on this tour is dropped and they continue with “Brighton Rock” and May’s long guitar solo. They play it straight with the return to the third verse instead of segueing into “Son & Daughter” like on previous tours. “‘39″ is the first time the played an acoustic number on stage and Freddie makes a big deal about it afterwards, saying, ”As you can gather, we like to try out the acoustic stuff and all the different styles that you hear on the albums. I just hope you don’t mind. I know we started off with rock and roll, but I think we’ve matured since then.” He sounds almost apologetic, recalling his defense of Hot Space at Milton Keynes five years later. “You Take My Breath Away” is a new song that is played only on this tour and live versions of it are special, especially in this sound quality. May’s two epics, “White Man” and “The Prophet’s Song” are melted into one long number with Freddie’s vocal gymnastics int he middle. 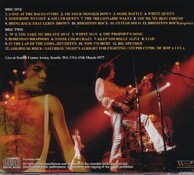 “Keep Yourself Alive” has a short drum solo, one that would be expanded on in future tours and the set ends with “In The Lap Of The Gods…Revisited.” “Now I’m Here” is the first encore and the rock and roll medley closes out the show and they cover Elton John’s “Saturday’s Alright For Fighting” for the first time live. The closing “God Save The Queen” is cut from the tape. A Day At Seattle is the first time this show has been released in almost ten years and the first time from the original tape in more than thirty. This is an essential Queen performance and release.